The Very Reverend Andrew C. Pearson, Jr.
Andrew was born in Washington DC and grew up in Virginia, working in youth ministries during his school years. After college he worked for a Christian ministry in Washington DC before heading off to seminary. He is a 2002 graduate of the University of Virginia and a 2007 graduate of the University of Oxford (Wycliffe Hall). 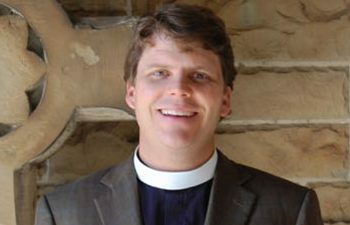 Andrew served as Associate Rector at the Parish Church of St. Helena, Beaufort, South Carolina, from 2007 until his call to the Advent in the fall of 2011. From 2011 through 2013 he served as Advent’s Canon for Parish Life and Evangelism, and he subsequently accepted the call to serve as Dean upon the retirement of Frank Limehouse in January 2014. Andrew is an avid golfer, outdoorsman, and reader. He is married to Lauren Saddler Pearson and they have three daughters, Lily, Mary Cabell, and Ware.